The Friday 56 hosted by Freda’s Voice, where you grab a book and turn to page 56 (or 56% of an ebook), find one or more sentences (no spoilers), and post them. A long time ago, almost thirty-four years past, you wrote to me requesting that I contact you should I ever wish to leave my home. I knew then that I would never live anywhere else, and so there was no point in my replying to you. I have lived in this house since I was eight years old but I am what people these days describe as ‘ancient’ and somewhat frail, and although I have managed perfectly well on my own until now, I know I am not long for this world. I have told my doctor I will move to a small nursing home as I realise it will be less trouble for him, and I have finally locked up the house. My family such as it was, is long dead. There is no one alive but me. I am instructing my solicitor to write to you at the address on your letter. Holmlea is yours if you still wish it. It was Mary who raced to Benkiln that fateful September of 1918 clutching a newspaper from France. I have read the cutting so often I know it by heart. ‘Arran gunner in brave attack on the Hun. Sergeant James Allan Pringle showed conspicuous gallantry and devotion to duty during an attack north of Bray-sur-Somme on 22 August. There were several things that caught my attention when I saw this book on display in the bookshop – first of all the cover, with its delicate colours, of a young woman entering a door, then the title with its hint of a past to be revealed, and thirdly the opening letter with its offer of a house on the Isle of Arran if Mrs Morrison still wished it. It’s a poignant letter, which saddened me a little with that sentence – There is no one alive but me. I’ve now read just over half of the book, which tells Elizabeth’s story along with that of Martha, Mrs Morrison’s daughter. I’ve never been to Arran, an island off the north-west coast of Scotland, but Kirsty Wark’s description is making me eager to see it for myself. 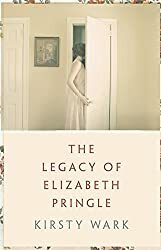 The book has a quiet, gentle atmosphere, which is also very compelling reading, packed with the events of both Elizabeth’s and Martha’s lives. The cover would definitely draw me in, too. Happy reading! I’ve not heard of this book. It does sound like an intriguing story. I am spotlighting Winter by Marissa Meyer this week. Happy reading! Oh, I like the sound of this one, Margaret. The cover is very nice and I love the letter that begins the book. Will be watching for your further thoughts on it. This one sounds like a good one. Oh, this does sound like a terrific mix of plot and history, Margaret. And the writing style in the bits you’ve shared draws me in, too. I’ll be eager to know what you think of it when you’ve finished. Sounds a little sad, but interesting as well. What a heartbreaking letter. Pulled me right in!! Sounds like a fantastic story! Happy weekend! I ended up being disappointed with this book, I thought the writing was quite bad in parts, but it did make want to visit Arran. My initial thoughts about this book are that it is really two stories in one – and I preferred the one about Elizabeth. I see from reviews on Goodreads and Amazon that opinion is split (as with most books) – some people thinking it is well written and others that it is not, is clunky, could do with editing, is over-written etc. What is meant by ‘over-written’? I like descriptive writing so the use of lots of adjectives doesn’t really bother me. I noticed them at the beginning, but then didn’t – not sure if that’s because I got used to them, or if Wark didn’t use so many later on. What is it about the writing that you thought was quite bad? Let me say WOW first. That letter really pulls me in. And what a clincher of a sentence! Icing on the cake – gorgeous cover! I love the cover…that alone would pull me in. That letter definitely makes me want to read on. Thanks for sharing….sounds quite good.